All news about Casiopeia, calculator games, development tools and community news will be posted here. Possibly you have heard about new refreshed casio calculators models. 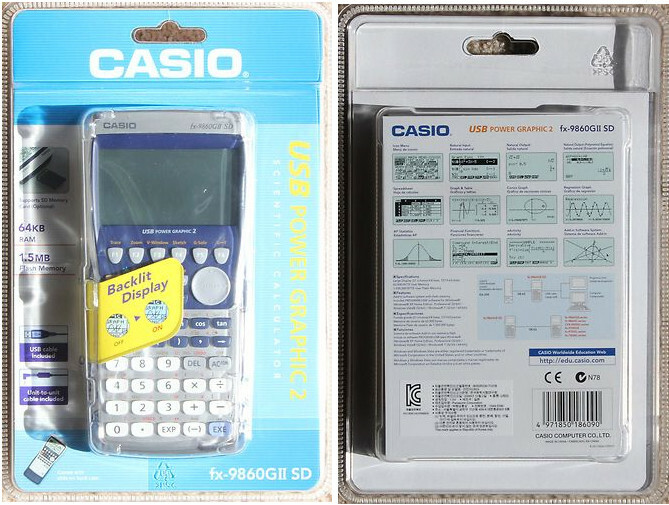 Perhaps for economic/market-related, or simply to add small features (like projector connection in classpad 330+ and 32gb sdhc card support in new fx9860...), Casio has upgraded their line of calculators with more powerful hardware. The new casio Fx9860 with label USB Power Graphic 2, now support sdhc cards up to 32gb and use an SH-4A CPU without FPU (SH-7305) like on the Prizm. However, programs/games compatibility is compromised, with changes in some sdk functions and port addresses. According to the reports of some users maybe more than 70% of the add-in games/programs do not work in the new model. If you want to buy a calculator of this serie, you must consider buying the old versions to be able to enjoy the games and applications developed by diverse communities. The community will need some time to start releasing/update software for this model. This model is easily identified, as I said earlier, by the label USB Power Graphic 2 under the screen and in box, or by the preinstalled firmware version "OS 2.02". On the left of the image is the new model USB Power Graphic 2, on the right is the old model. I have written some time ago, a post about major changes in this new model, can be found here. 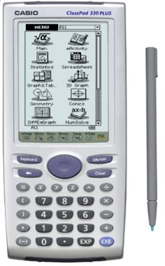 -Is possible use this Classpad with Casio Compatible Projectors like Prizm! -The calculator is a usb disk when connected to pc, like prizm. You no longer need to use software like FA-CP1 to put file on calc. Maybe the restriction on the transmission of unknown extension files to the calculator is removed (unconfirmed yet). -The compatibility with old games/programs was broken. This classpad use add-ins with new extension (.c1a), and there is no sample add-in or sdk yet. -Old eActivity format (.fls) and program basic format (.mcs) used during classpad OS 1/2 are not supported in this model. You need convert .fls->.xcp (eActivity) and .mcs->.vcp (programs) with classpad manager. This 2 models also received a new cpu according to cfxm. They have no label, the new models are detectable by the OS version 2.02, only (or by inspecting the board), according to SimonLothar. I think it is still possible to mod fx-9750GII into fx9860 gii sd power graphic 2, you only need a fx9860 os 2.02 image (unconfirmed yet). If it really is possible, problems of compatibility with add-ins in fx9860 power graphic 2 persist in this calcs. 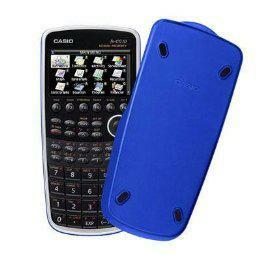 Casio released a casio fx-cg10 model with a blue case in usa. The hardware is the same, is only a aesthetic change. 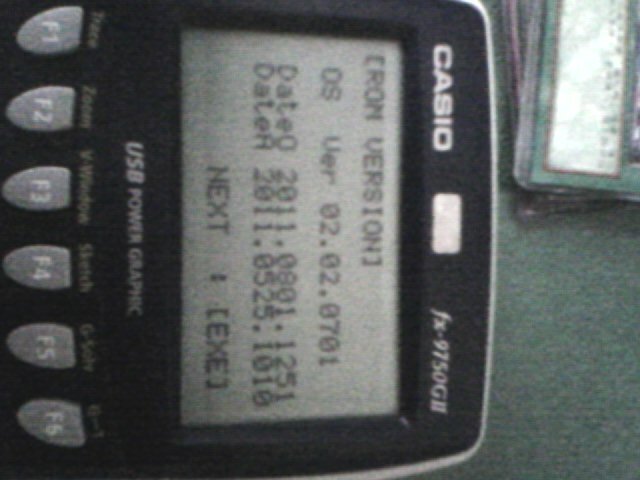 If you are a gamer/student and want to buy a new of these calculators, you must find the old version. The new changes alone are not attractive, until developers turn to these new models. If you're a casio developer, you should look for this post and adapt your add-ins for new models. There is also some information in fx_calculators_SuperH_based documentation by SimonLothar. 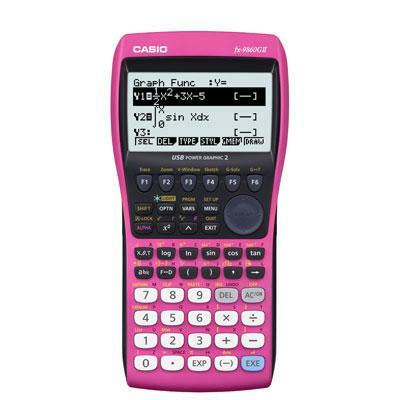 I found in an online store a (new) casio fx9860GII POWER GRAPHIC 2 with pink color and without SD card slot. A new (regional) version of the fx9860g series called "FX-9860GII S" is already being sold in some online stores, destined to NY Schools. The new model was originally found by djomnimaga at omnimaga. Graphing Calculator NY Schools - Special School Model. Allows students to input in a natural textbook display fashion but the fx-9860GII S outputs or displays results only in format allowed by schools. 4-AAA batteries included. Probably it always shows the results in decimal form and without simplifications. For example, on "normal" calculators, 14/10 prints 7/5 (if you use the fraction button for the /) and sqrt(5)+sqrt(9) prints 3+sqrt(5). On that model, it probably prints as 1.4 and 5.236... as the simpler scientific calculators do. So, I am further confused by the possibility of developing an Add-In which does not run on the majority of 9860GII out there. What do I need to do to ensure compatibility ? I currently have a copy of the Casio SDK downloaded from their site. 9750head wrote: So, I am further confused by the possibility of developing an Add-In which does not run on the majority of 9860GII out there. What do I need to do to ensure compatibility ? I currently have a copy of the Casio SDK downloaded from their site. As long as you do not use IsKeyDown and IsKeyUp, the CASIO SDK will do for a start. If you want to do some advanced stuff, you will need syscalls. Any hardware specific programming like accessing MPU registers directly will most probably lead to compatibility problems, if you do not do a MPU-type case switch. Thanks Simon - that has given me a little more confidence that it's worthwhile to get stuck into this without wasting my time.. Does this mean if I get an fx-9860GII without label "USB Power Graphic 2", the add-ins for fx-9860G would still work? gotoAndDie wrote: Does this mean if I get an fx-9860GII without label "USB Power Graphic 2", the add-ins for fx-9860G would still work? Yes, add-ins will continue to work. If you get an "USB Power Graphic 2", you can modify the add-in code (if you have the source code) and recompile it or you can use Ziqumu Sh4 online tool to fix it.